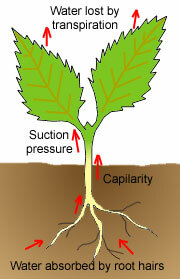 Most of the water entering a plant's root will exit the leaves by transpiration. Transpiration in plants is the passage of watery vapor through the stomata of plant tissue. By knowing the amount of water exiting each plant trough the process of transpiration we can estimate the amount of water the plant needs. We can also compare different plants based on their need to water and select the best plants for different locations based on the availability of water. The rate of transpiration may also change in different hours of the day, so while using automated irrigation systems, we can increase or decrease the amount of water supplied to the plant based on the time of the day. In this project you can perform two different studies related to the transpiration. In one study you compare the transpiration of different plants under the same environmental conditions. In the other you compare the transpiration rate of one specific plant in different times of the day. You may as well study the effect of other factors such as light and temperature on the rate of transpiration. How does the transpiration rate vary in different plants? How does the transpiration rate change in different times of a day? This is an experimental science project. This project guide also contains recommendations for defining variables, hypothesis and experiments. More details or support for this project is available for the members of ScienceProject.com web site. Material needed for experiment may be found locally or purchased online.